After reviewing a number of laser training systems, I now have the pleasure of testing Next Level Training’s SIRT Pro Training Pistol. I got a few minutes with this tool at SHOTShow 2014, and was very impressed with the realism of the product. The SIRT Pro is shaped just like a Glock 17. The slide is metal and the frame plastic, just like the real thing. Even the weight is similar and it has a detachable weighted magazine. The SIRT has two built-in lasers. The laser that comes from within the muzzel is green and appears when the trigger is fully depressed. 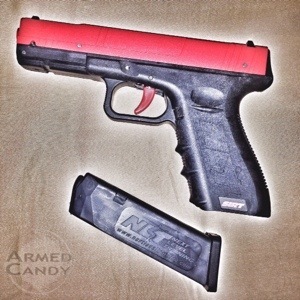 A red laser appears from just below the muzzel and is activated anytime the trigger is touched. It is called the “trigger prep laser”. A small switch on the top of the slide allows the user to turn the trigger prep laser on or off. These are the only function options the SIRT offers. Why would you want the trigger prep laser on or off? Well, if you want to see the difference in the movement of the gun from the beginning to end of your trigger press, the first light can be helpful. It can also be useful to an instructor who is watching over your shoulder. I am planning to compare the SIRT to some of the other laser training systems that I have previously reviewed, and even how they can be combined for more training options, but we will save that for another post. 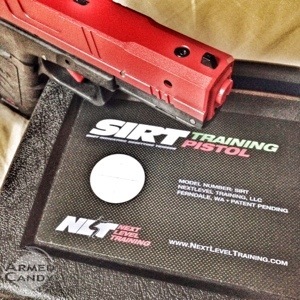 For now we will take a first look at the SIRT Pistol as well as discuss the future, as Next Level Training sees it. When I opened the box containing the SIRT, the first thing I noticed was that it doesn’t have an on/off switch, no batteries to install and very few instructions in the box. I just picked it up and began using it. And this is exactly as the manufacturer intends. They prefer this simplicity. There are no trargets to set up, no slide to rack, just a “dot to lock down”. 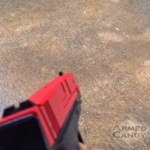 You can pick it up for a minute long session; Take a few precise trigger pulls, then go back to your day. Next Level Training hopes that because it’s so simple, you’ll use it, and use it often. The goal is to keep the green laser dot as a dot and not let it turn into a “dash” as the trigger is pressed. This is not the easiest thing to do. The trigger on the SIRT makes the task especially tough. It feels pretty similar to a Glock 17 trigger (though a lot more springy) and weighs an average of 9lbs 7oz. (Trigger weight measurement sponsored by Brownells) If you are not a Glock person, an M&P SIRT should be available later this month. As I began to work with the SIRT, I quickly noticed how I couldn’t see the lasers. I assumed that this was intentional and that the manufacturer meant for the the product to be used within a classroom setting with an instructor looking on. Not exactly. I was informed that this wasn’t really the idea. Tools are included to adjust the lasers, but NLT said, that the laser strikes are easier to see when the shooter has both eyes open. What a neat trick! However, The idea is not that the lasers be used as a sighting-in tool, NLT explained to me. The lasers should not align with the top of the front sight, but where a shot would actually land. They would like to impress upon users “target focused shooting”. Gun humor: what caliber for Cylons? I have played around with one in a training class and overall really liked it. However the price tag so far hind of a turn off. Dry fire still cheaper, but I can see some benefit to using the sirt and maybe something down the road to look at. Will be interested to see if you think they are worth the price. A huge aspect on the SIRT is force on force training with a low cost, easy to use simulator that requires no advanced safety gear, converted live fire weapons, and can be done pretty much in any location since nothing more than light is projected. I won a SIRT at a pistol match about a year ago. I had played with one at couple of classes and liked the idea. I couldn’t get past the price for myself, but I am very glad I have one. It is a great tool. There are cheaper SIRT options. The Student model is around the $200 mark, I believe. They have been promising an M&P version for the last 2 years. Still waiting. I’ve had one since November. I think It’s kept the rust off during the long winter. Strengths compared to a standard laser insert that needs a slide rack to operate every shot: Shooting on the move and multiple target transitions.